The flag of North Vancouver is based upon the coat of arms. SHIELD : The twin peaks of the Lions rise above the waves of the harbour, denoting the City’s geographic position on the North Shore. The late 19th century sailing ship represents maritime-based commerce and the first vessels to bring industry and settlers to Moodyville, the original Victorian settlement. The mountain lion heads are an ancient symbol of strength and emphasize the mountains which are the most famous local landmark. CREST : Above the helmet is a Crown of maple leaves and dogwoods signifying Canada and British Columbia. The wood grouse is an allusion to the mountain which rises directly north of the City. The grouse and sprig of salal refer to our rich natural environment. SUPPORTERS : The black bear and salmon represent the environment, the economy and links between the native and European peoples. Traditionally, the bear and salmon were important in the ceremonial life of the Salish people. The bear and salmon each carries about its neck a unique symbol of Salish art - the spindle whorl, which was used in the native spinning and weaving process. The whorls represent domestic arts - the one is carved with a bear, the other with a salmon. COMPARTMENT : The compartment on which the two supporters stand is composed of forest and sea, the twin foundations of the City’s situation and prosperity. MOTTO : A double pun on the City’s name and location and a phrase summing up the City’s aspirations. It is worth noting that several charges, or portions of these new arms, appear in lawful heraldry for the first time, notably the sprig of salal and the two spindle whorls. Of the latter, the bear design is particularly interesting as it was created particularly to meet this need by Susan Sparrow, one of British Columbia's leading Salish artists. Thie image above is courtesy of The Flag Shop in Vancouver, as although this picture seems to show a "sinister hoist", I have a couple of pictures of flags flying outdoors, which clearly show that the flag, as used outdoors at least, is one-sided and the text is only legible on the Obverse. The FLICKR contributor pointed out that the City of North Vancouver had its centennial in 2007, but this was not a centennial flag, rather the flag and arms were granted for the 75th anniversary, as noted in above. 1907 was the date that the City split from the much larger District; it later absorbed the community of Moodyville, mentioned in the text, which had never been part of the District. On page 2 of the Council Minutes (1981-05-010 it is noted that Robert Watt, later Chief Herald of Canada, and sometime North Vancouverite, was part of the committee to design the arms and petition York Herald in England's College of Arms (British Columbian Conrad Swan). 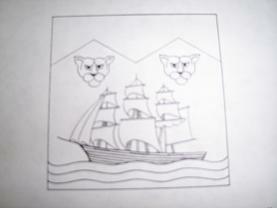 Council specified that the ship be of the type used in the area in the 19th Century and that the Lions in the arms be depicted as Mountain Lions (aka cougars, felis conlocor) native to the area. The flag includes the Coronet of Maple Leaves and Dogwoods, the name "CITY OF NORTH VANCOUVER", the motto, "LION OF THE NORTH", and the date "INC. 1907", in addition to the shield of arms. The draft sketch presented to council in 1981 was prepared by Irene Alexander. The North Vancouver City Council also uses a banner of arms to represent the council, rather than the city as a whole.